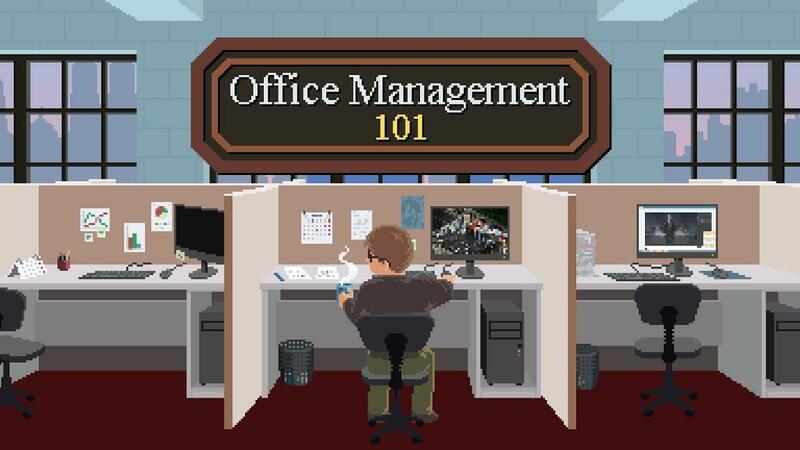 Office Management 101 is an isometric business simulator envisioned in the image of tycoon classics. Poking fun at the corporate world, the game features quirky characters, slapstick humor, and unexpected events in a cheerful and detailed capitalist dystopia. As the CEO of a fresh consumer electronics company you must hire employees, design your office and turn your humble firm into a ruthless money-making machine. A deep system of employee productivity and social interactions combined with procedural generation allows a variety of playstyles. You are the boss now! Recruit, underpay and overwork your workforce! Master the art of Office Architecture and Decoration! Devise high-priced products for gullible consumers! Annihilate the competition by any means necessary! Engage in a corporate plot of EPIC proportions in the Campaign Mode! Follow your own path to glory in Freeplay and Sandbox Modes! Expanded gameplay with Steam Workshop mod support and Twitch integration! You can find the demo on itch.io and wishlist for the release on Steam. Looking over their various comments, they're not setting an exact date for release just yet, as they're not currently working on it full-time. Sadly, I couldn't get the demo to work so I've let them know. This is awsome!! I've wishlisted it!! The executable didn't work for me. But running the .jar file with java -jar om101_drm_free.jar worked like a charm. I just realized I was triggered when reading the word "Epic". I will prefer my copy in a corporate plot of Steam proportions, please.